Category: Yakimono (grilled). Season: available year round. Ask a sushi aficionado how they judge a sushi restaurant or itamae, and you will get one of two answers: by their kohada or by their tamago, as both require arduous preparation, a lot of practice, and a lot of skill. Although every chef will have a slightly different recipe, Edomae-style tamago typically includes egg (obviously), ground shrimp, sugar, salt, yam or Japanese potato, mirin, eel or fish paste, and shoyu, in various quantities. Ingredients are usually stirred together for quite a while (30+ minutes), then whisked and very carefully cooked in a rectangular cooking pan called a makiyakinabe. It is notoriously easy to overcook this dish, and very hard to consistently deliver a product that is delicious and balanced. 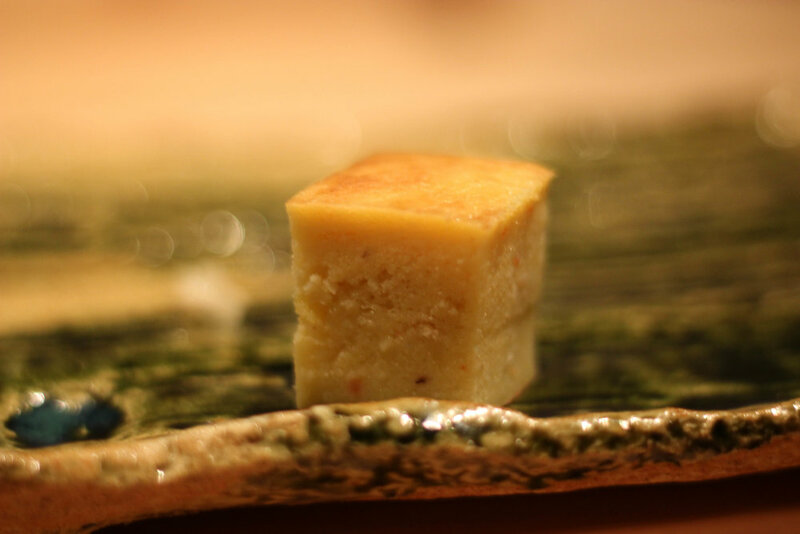 A well-executed piece of tamago should be sweet and delicate, yet will have umami flavors from the shrimp and fish paste, and will also be dense like a soufflé. It is considered by many to be the best way to finish a great sushi meal.